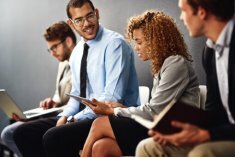 Connecting local talent to the businesses that want to hire them. CareerSource Citrus Levy Marion is the region’s leader in workforce development. We collaborate with community partners to develop world-class education/training and employment services to meet regional needs. Last year, CareerSource Citrus Levy Marion provided services to more than 20,000 candidates and more than 1,300 businesses. Our nonprofit, business-led board sets policy and oversees $10 million in grants and other funds that support the workforce mission. Growing your career or business? Let us help!
" CareerSource CLM has been great to me. In this most recent stint, I've had Nicole (Rivera) train here for some months now and in return have had an extra assistant without the extra payroll expense. " " I am very grateful to be here because I've learned a lot ... For anyone seeking employment, I'd tell them the great things CareerSource CLM has done for me. " " Through its affiliate Talent Center, CareerSource CLM made my transition from college graduate to working in the field very simple and streamlined. I am provided ample opportunity to learn and grow at my current company, eResources. "